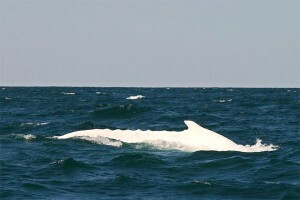 Migaloo is the world’s only completely white humpback whale which researchers are almost certain is an albino. The 20 year old male whale was spotted at the end of the last tour of the day in a pod of up to 6 other humpback whales. The competitive behavior of Migaloo and the other whales suggests these were all males with one thing on their mind, nearby females. This is the 3rd time Whale Watching Byron Bay has been lucky enough to have encountered Migaloo on his annual migration along Australia’s east coast. 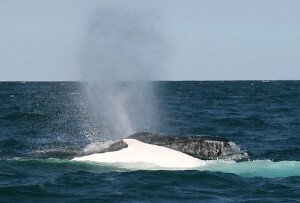 Photos have been taken yesterday by owner Robert Dalton from Byron Bay Whale Watching’s tour. Be quick and book your whale watching accommodation package at Planula before the whales are gone for the year. This entry was posted on Tuesday, September 29th, 2009 at 9:09 am	and is filed under Planula News. You can follow any responses to this entry through the RSS 2.0 feed. Both comments and pings are currently closed.